Now that the cupcake calamity has subsided, I’m ready to recap the rousing day that was Cupcake Smash 2013. Oooooh my goodness. My life is a whirlwind right now, capped off by the impending task of baking 500 cupcakes tomorrow. Yes, you read that right: Several hundred cupcakes. In one day. In my relatively small kitchen. Why? Because I’m helping Philabundance “beet” and “squash” hunger in the tri-state area as part of the third annual Cupcake Smash this Saturday at the Piazza in Philadelphia. You may recall I won People’s Choice last year with my “Fruit Loopy” cupcakes, but the competition looks tough this year and I’m hoping I can deliver on these grandiose plans I’ve created. I’m not divulging anything just yet, but would love for you to come check out the event yourself. Online ticketing closes Friday at noon, but limited tickets will be available at the door. All the details can be found here, and the official press release is below. Hope to see you there! 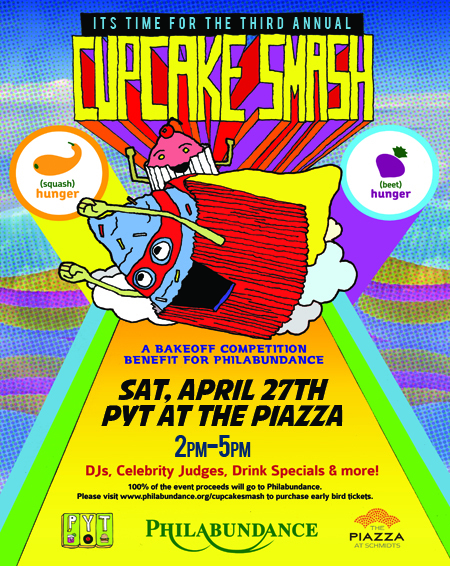 Philadelphia, Pa- April 10, 2013- Philabundance, the Delaware Valley’s largest hunger relief organization, is throwing the third annual Cupcake Smash at The Piazza at Schmidts on Saturday, April 27th from 2pm-5pm. Philabundance and PYT are joining forces with The Piazza to raise money for people in need of food in the Delaware Valley. 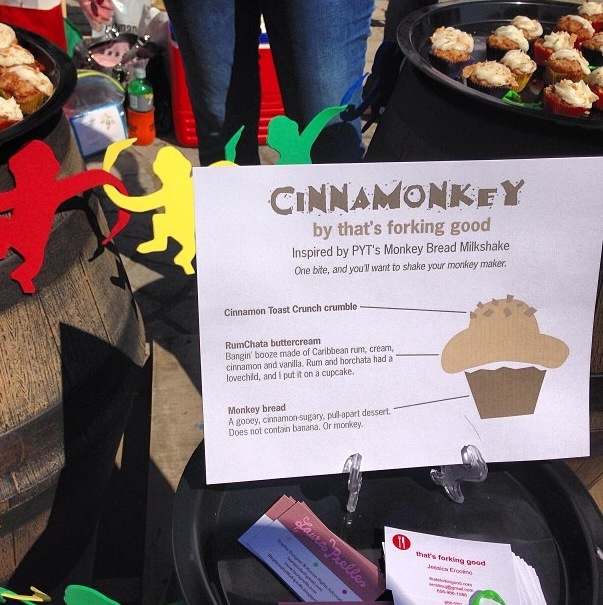 Professional and amateur bakers alike will vie for the tastiest PYT themed cupcake to be deemed #1 by celebrity judges and the “People’s Choice.” Advance tickets are on sale now for $25 and can be purchased online or at the door for $30. All proceeds benefit Philabundance. Mule Farms Spodee. Uber, “everyone’s favorite driver,” is offering Cupcake Smash attendees a free ride from the Piazza up to $20 with a special promo code. Cupcake Smash is made possible by The Piazza at Schmidts, PYT, Philadelphia City Paper, Radio 104.5, Barefoot Wine & Bubbly, KIND Snacks, Pabst Blue Ribbon, Philadelphia Chocolate Tours, Philadelphia Distilling, White Mule Farms Spodee, Uber and Yelp . For more information, please call 215-339-0900 or visit http://www.philabundance.org. Posted on April 26, 2013 Categories notes REMOVELeave a comment on cupcakes! booze! philanthropy! It’s baaaaaaaaack! Cupcake Smash 2013 is April 27, and you should come out to try some crazy cupcakes, drink delightful spirits and raise money to fight hunger. I just got back from a super fun happy hour meetup with fellow contestants, and I’m so excited to see what everyone will be serving at the third annual Smash!